Mathematics for Financial Analysis focuses on the application of mathematics in financial analysis, including applications of differentiation, logarithmic functions, and compounding. The publication first ponders on equations and graphs, vectors and matrices, and linear programming. Discussions focus on duality and minimization problems, systems of linear inequalities, linear programs, matrix inversion, properties of matrices and vectors, vector products, equations and graphs, higher dimensional spaces, distance in the plane, coordinate geometry, and inequalities and absolute value. The text then examines differential calculus, applications of differentiation, and antidifferentiation and definite integration. Topics include fundamental theorem of calculus, definite integral, profit optimization in a monopoly, revenue from taxation, curve sketching, concavity and points of inflection, and rules for differentiation. The book examines the applications of integration and differentiation and integration of exponential and logarithmic functions, including exponential and logarithmic functions, differentiation and integration of logarithmic functions, and continuous compounding. 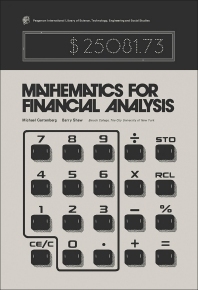 The publication is a valuable source of data for researchers interested in the application of mathematics in financial analysis.